Lately, you’ve started seeing on social media a slew of ads for “HVAC Scheduling Software”. You run an HVAC service and repair company. Accurate, error-free scheduling is your dream. Your current system is prone to errors, you’ve heard all about HVAC scheduling software, so you look into this and want to find out what is the best HVAC scheduling software for your company – a program that will automate your scheduling and dispatch functions, eliminate scheduling and dispatching errors almost entirely, and make your company more efficient. So which is the best HVAC Scheduling Software for your business? There are hundreds of different programs on the market that all promise to automate your business and do everything you need to do to bring your business into the 21st century. Some programs handle some functions of your business, but won’t be able to handle others. 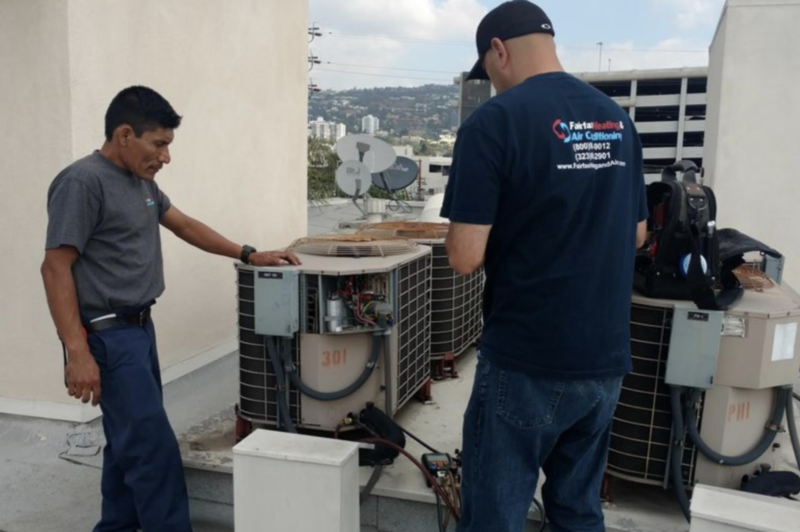 There is only one HVAC scheduling software on the market that delivers everything that it promises — and that’s FieldSurf. Let’s look at all the features of FieldSurf and see what it can do for your business. With FieldSurf, your scheduling function becomes totally automated. Everything in FieldSurf is controlled from a single dashboard. Your dispatcher can see at a single glance which technicians are working at which locations, which jobs have been completed and which jobs are still not completed, which time-slots are available for service calls, and which technicians are available to service the next call when it comes in. When a call comes in, your scheduler immediately reserves the customer’s requested arrival time. This immediately places that time-slot on “hold” until that slot is either confirmed or released. At the same time, a new Work Order is created. If the caller is a repeat customer, the scheduler simply enters the last name of the customer, and all the required details will automatically populate. If it’s a new customer, the scheduler will need to enter all the customer’s details into the new Work Order. At the same time that the Work Order is created, an Invoice for that job is created simultaneously. This eliminates the problem of forgetting to create an Invoice for a new job. Okay, so your dispatcher has now scheduled a new job from an incoming call. The next thing he has to do is dispatch that call to the right technician. And that’s where FieldSurf is a dream. FieldSurf is so much more than just HVAC scheduling software. It totally automates your dispatch function, making it a breeze and eliminating dispatching errors. FieldSurf has a unique internal SMS messaging system that allows instant two-way messaging between everyone in your business – your field technicians, your office staff, and you and your management team. The dispatcher texts the technician with his next assignment. The technician goes into FieldSurf, and can see the Work Order with all the notes informing him of the situation, and sending him the customer’s details. Your dispatcher then consults FieldSurf’s proprietary “Tech Tracker” feature, where he can locate on a GPS map the exact position of each of your technicians in the field. Your dispatcher then sends the nearest technician available to the next job. FieldSurf’s SMS capabilities have further advantages: if your tech is running late because he hasn’t completed his current job, the next customer is informed by SMS that your tech will be arriving late, and gives your customer your technician’s new expected time of arrival (ETA). Customers really appreciate this — they can attend to something else instead of waiting around, or they don’t have to rush over to the property if you’re going to be late. And if the customer is delayed and will not be available at the stated time, the customer can SMS your tech, so your tech can go and grab that donut and Coke and won’t keep anyone waiting. Everyone is on the same page when you use FieldSurf. If you think FieldSurf is just HVAC scheduling software or HVAC dispatching software, you should take a lot at what else it can do for your business to put you in better control of everything. A unique feature of FieldSurf is the way is automates your Inventory control. Every business owner needs to know how much inventory he has on hand at any particular time. If you carry too little, you risk running out of product, which can mean you lose a sale, or you have to run out and buy the product/part at full retail price, so you won’t be making the right amount of money for that job. Or, if you carry too much inventory, you’re tying up capital unnecessarily. FieldSurf puts you in total control of your Inventory function. When products, parts or supplies arrive at your shop, you enter each product into FieldSurf’s Inventory module. You can scan in a picture of the product, the product barcode, and the number of units. Then, when a technician removes an item from your warehouse and places it in his service vehicle, FieldSurf makes a note of that. You can access FieldSurf at any time and know exactly how much product each of your techs has in his truck. Then, when the customer sells the item to the customer, the transaction is noted on the Work Order and the customer’s invoice, and one unit of that item is then deducted from the inventory in your warehouse and from your technican’s inventory. When you reach a predetermined level, FieldSurf then informs you that you have to reorder that part/item. With FieldSurf you never run of product and you always know exactly how much of any product you have on hand in your warehouse and how much product is in the trucks of your techs. FieldSurf gives you total control of your Inventory management. FieldSurf also handles your entire payroll function. Your technicians use FieldSurf to clock in and out of each day and each job. It automatically calculates payroll earned by each of your technicians on each job. It even can calculate any commissions that might be due to your technicians. FieldSurf also gives you total — and remote — access to all your financials. You can access these financials from anywhere at any time — from a desktop computer, from a tablet computer, and even from a smartphone. That means you always have total access to every aspect of your business from any location. FieldSurf generates a number of extremely valuable financial reports, so you can always tell how you’re doing, how your sales are going, and you can compare them with those from another period, and you always know what’s going on in your business. FieldSurf is so much more that merely being HVAC scheduling software. You owe it to yourself to take a good look at FieldSurf field service management software for HVAC companies. It will bring your HVAC business into the 21st century.